This story was updated at 5:01 p.m. EDT. Russia's space agency announced today (Sept. 13) that it will launch a robotic cargo ship to the International Space Station in late October, then follow up with a manned space capsule flight in November — the first station-bound missions since a rocket failure last month temporarily grounded the Russian Soyuz rocket fleet. NASA has not yet confirmed the new Soyuz launch dates, but agency spokesman Kelly Humphries said that both parties continue to work together in support of the International Space Station. "We're working with our Russian partners on the progress of their investigation and the Progress launch failure, and we're working with them to determine when will be a good time to resume human spaceflight on the rocket Soyuz," Humphries told SPACE.com. 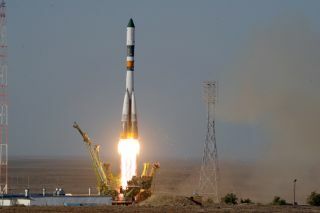 The new projected launch schedule is based on the findings of an investigation into the cause of the agency's Soyuz rocket failure in late August, RIA Novosti reported. A robotic Progress 44 cargo spacecraft crashed in Siberia on Aug. 24 after its Soyuz rocket suffered an engine glitch shortly after liftoff. The Progress freighter and 2.9 tons of onboard supplies bound for the space station were lost. The accident marked a rare anomaly for the famously dependable Soyuz vehicles. An investigation traced the root of the problem to a blocked pipe in the fuel line to the Soyuz rocket's third stage engine, according to Roscosmos. The inquiry labeled the incident as "accidental," but recommended measures to ensure the same defect does not plague similar engines, according to RIA Novosti. Following the loss of the Russian Progress spacecraft, NASA stated that no manned Soyuz rockets will launch new crewmembers into orbit until the problem has been resolved, opening up the possibility that the space station could be left without a crew for a period of time. With the retirement of NASA's space shuttle program, the agency is relying on Russian Soyuz spacecraft to launch its astronauts to the International Space Station until commercial vehicles are ready and have been adequately tested for safety. The Russian Progress supply ships also play a critical role in ferrying supplies to the space station. European and Japanese robotic spacecraft are also used to ensure that the orbiting laboratory has adequate food, hardware and any necessary spare parts.